KFC launched a private investigation to look into claims. YOU’VE PROBABLY SEEN the story about the little girl kicked out of KFC fill up your Facebook feed over the last week. Well, it may have all been a hoax. 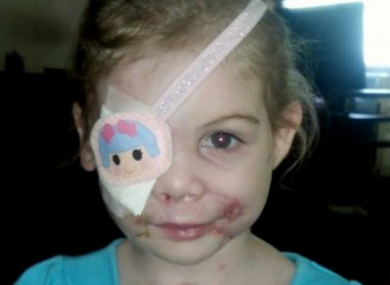 Little 3-year-old Victoria Wilcher was attacked by three pitbulls owned by her grandfather which left her with various facial scars. She had a broken upper and lower jaw, broken nose and right eye socket. The little girl also lost her right eye completely and the ability to move the right side of her face. But what really riled people up, was the story about her treatment at KFC, as the youngster’s family claimed that they were asked to leave in a branch in Jackson, Mississippi, because her scars were disturbing people. After the accusation, came the internet outrage, and the story was shared everywhere. According to the Clarion-Ledger, KFC hired a third-party investigator to examine the serious claim as evidence that it ever happened is somewhat lacking. There’s also the matter of the anonymous source who came to the paper to claim that the little girl’s family received over $135,000 in cash donations through a Go Fund It campaign and gifts including free surgical procedures. The family initially told KFC the incident happened at the location on State and High streets, a claim backed by a Facebook post by Victoria’s Victories, a page run by Teri Rials Bates, the girl’s aunt that read: “Thank you for your support for Victoria. If you would like to file a complaint its the KFC on State Street in Jackson MS.” That store is not in operation and has been closed for several years. Victoria’s aunt claimed to be the one writing on the Facebook page and said it was a mistake, the store was actually Woodrow Wilson. Security footage from that branch was reviewed and no customers matching Victoria and her family were found. Receipts were also examined against their order, but no match was found. Along with the KFC Corporation, we are determined to get to the truth and address the situation appropriately. I promise its not a hoax, I never thought any of this would blow up the way it has. The article circling the web calling this a hoax is untrue. The article it self say the investigation is not complete. It is not over until KFC releases a statement. Please do not believe untrue media. I have personally watched this family go without to provide for Victoria. They have not and would not do anything to hurt Victoria in any way. Email “Little girl kicked out of KFC over scars was a hoax, investigators claim”. Feedback on “Little girl kicked out of KFC over scars was a hoax, investigators claim”.